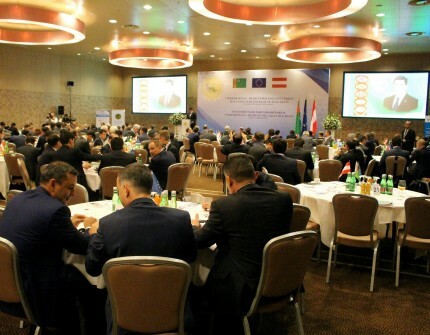 On September 5-6, 2018, the Investment and Partnership Forum "Turkmenistan - the Heart of the Great Silk Road", was held in Vienna, the Republic of Austria. During the forum, a video on the economic development of Turkmenistan was presented as well as presentations on various topics in the field of economy, foreign trade, transport, communications, mining and processing of minerals, the private sector, taxation, industry, agro-industry, agriculture, banking, services, tourism development, quality infrastructure, product conformity assessment were held. A number of bilateral documents have been signed on the side of this Forum, contributing to the further development of both bilateral and multilateral relations of Turkmenistan with European countries in the private sector. Within the framework of the Forum, the Exhibition of economic achievements of Turkmenistan was organized. At the exhibition, European partners were presented with a wide range of goods and products produced in Turkmenistan. It is worth noting that all exhibited products at this exhibition are made from raw materials, produced in Turkmenistan and are environmentally friendly. As a result of the event, the sides noted that such events are important and provide a timely opportunity to discuss the potential joint contribution of the two countries to the development of trade and economic cooperation.